First of all, did I just go almost two months without finishing a book? Yikes!! I have actually been reading this most of the time, but my focus has been pretty split with work and life. I read The Lake, The River, & The Other Lake by Steve Amick as a book to fit the fifth category on the challenge list - a book set in your home state. Despite my rather pitiful pace, I really did enjoy this book when I had some time to pick it up and read it. I actually finished most of the second half over the course of the holiday weekend, and this morning. 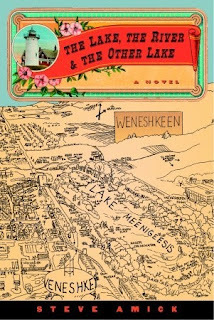 The characters were very engaging in the little fictional town of Weneshkeen, Michigan. It was easy to picture the setting as any little tourist town on the west coast of Michigan. The book covered one summer, complete with the ongoing drama of the year-round residents, and the added complications of the fudgies, just in town for the summer. While it didn't strike me while I was reading, one enraged reviewer on Amazon pointed out that part of the book is a rather explicit description of one character's descent into pedophilia. I only mention it to say that I'd definitely consider this book for a more mature audience. The set up may have been a little slow, or I may have had an exceptionally busy spring. But once I was getting to know everyone in the book, I wanted to keep reading and see whose story the next chapter was about. I could imagine them all as real people, in exactly the roles they were cast. Overall, I really enjoyed this book and wouldn't mind reading more about these particular people. Sounds interesting. I love reading books that take place in MI, although I'm more of a drama/mystery book reader. It sounds interesting. I love books set in Michigan. I've been slacking on my reading these past few months too. Once I get into the groove, I'll read a ton of books in a row, but I've just been busy with other things. There just isn't enough time in a day. This sounds interesting. I really need to pick up on my to-read pile of books. It's getting way too big. Sounds like a very interesting book to read. Very nice plot or story. Great! Sigh. I wish I had more time for reading. Life is super busy right now, and I feel my brain slowly turning to mush without my books.